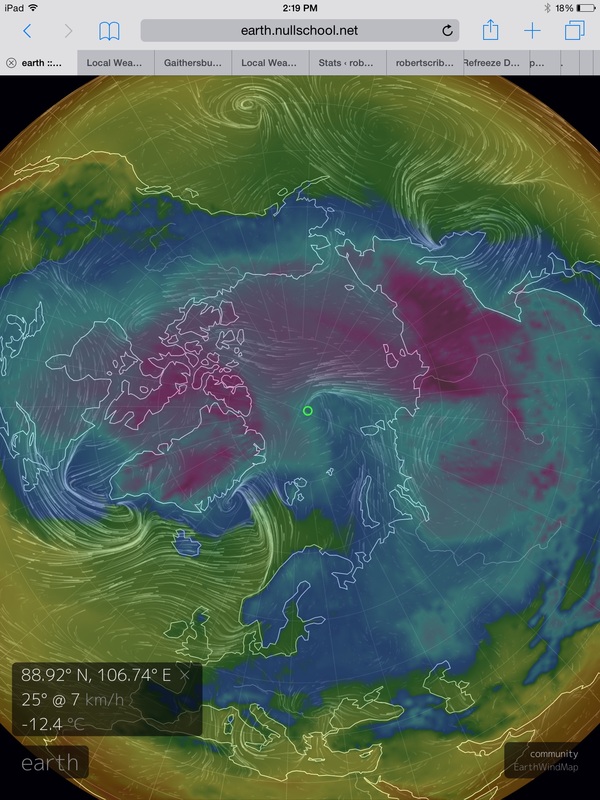 It’s another winter of far above average temperatures for the Arctic. Warm air has risen — south to north — over both the North Atlantic and Pacific. It has ridden through the Bering and Barents seas. And it has invaded an Arctic sea ice pack that is far, far more fragile than it has ever been in modern human reckoning. The winds have been fed by the warmest ocean surface temperatures ever seen in the aftermath of the hottest year on record (2014). They have pushed against ice packs off Irkutsk in Russia. They have driven ice northward and melted it throughout the Bering. And they have pushed 10-20 foot waves against the ice along the coasts of Greenland, in the Strait near Svalbard, and in the Barents west of Novaya Zemlya. This warm air influx has had a strong effect on the sea ice. Even in the far north near the pole, sea ice has been occasionally observed to thin this winter, reaching 80-90 percent concentration in a broad patch just south of the pole. Marked thinning for an area from which thicker, multi-year ice has undergone an extended retreat and 2 meter thick ice is now the mainstay. A mere shadow of ice for a region that once featured great hills and mounds of stable ice bounded by bridges between the North American and Asian Continents. At the current measure of 14,450,000 square kilometers, that’s well less than what we’ve seen during previous decades. More than 2,000,000 square kilometers, or about an area the size of Greenland, less than 1979’s extent for March 1, for example. And the total could well go lower — testing new record ranges for early March. 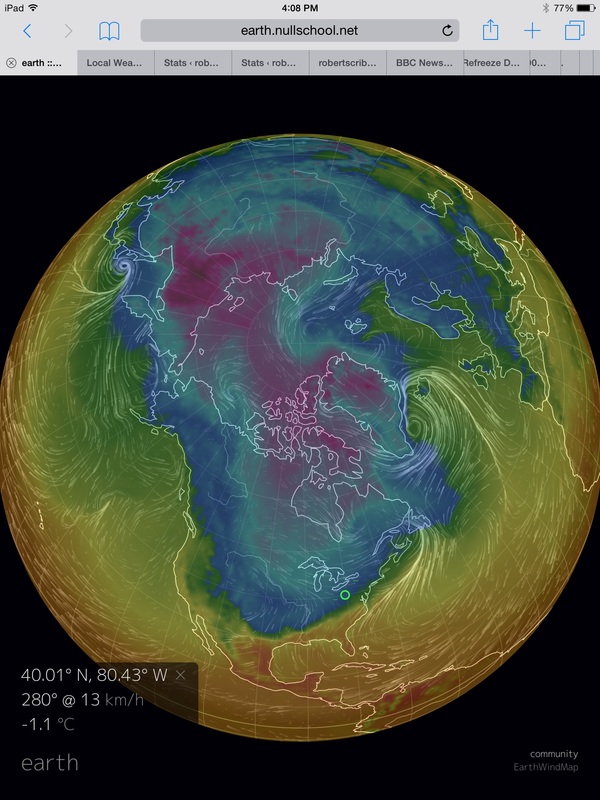 For the Arctic is about to see another major influx of warm air. For comparison Ohio, many hundreds of miles to the south and well outside the Arctic, will see the same reading at the same time. It’s another major warm air influx that will again drive against the ice pack. 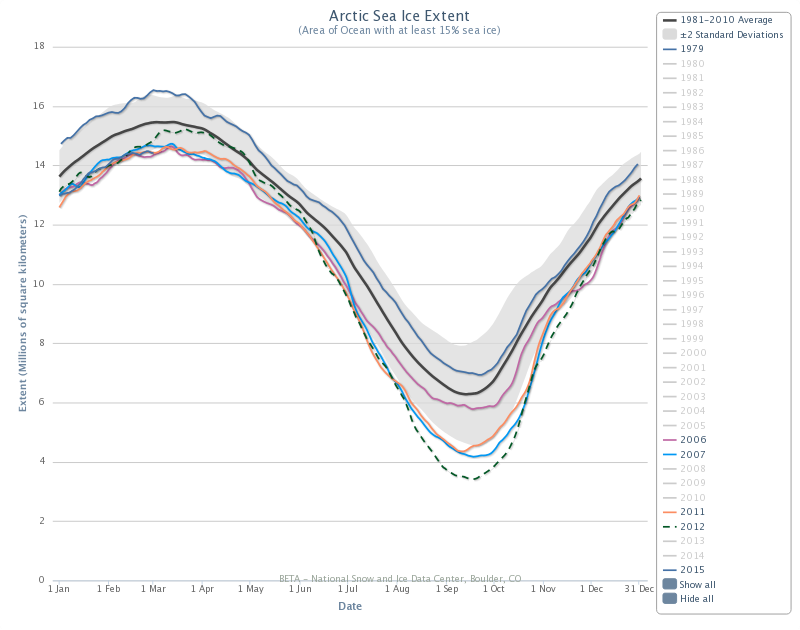 A continuation of a decades long assault that will bring with it further threat of record lows in Arctic sea ice. One that could set the 2015 melt season up for a rather low launching pad if the major gains seen during this time of year in 2012, 2013, and 2014 don’t manage to materialize. As Arctic sea ice faces the potential for new all-time lows, a recently released NASA study puts these losses in a global context. 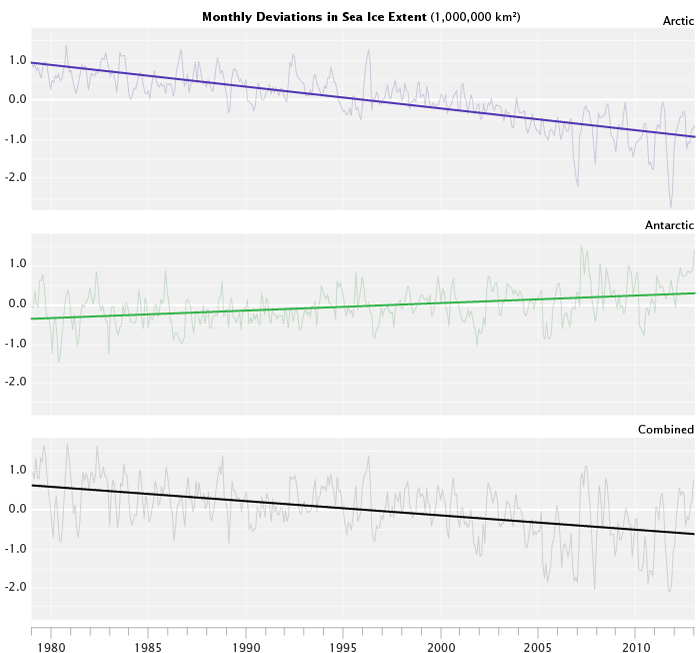 This important broader assessment shows that both Arctic sea ice loss and global sea ice loss since 1979 has followed an unequivocal trend of thinning and recession. This ongoing loss is despite the fact that Antarctica has seen some minor gains in sea ice extent during that same period. Massive losses in the Arctic are likely due to the fact that the sea ice there sits upon a warming ocean surrounded by warming continents. By contrast, Antarctic sea ice sits in the Southern Ocean whose surface waters are often cooled both by winds and by an increasing outflow of cold, fresh water from the melting Antarctic glaciers. Factors that serve as a minor surface counter-trend to the larger warming signal. A signal, that for Antarctica, is driving an assault of warm water at the ice sheets from the depth of hundreds of feet below the ocean surface. Overall, the Arctic has lost of an average of 2 million square kilometers since 1979. Antarctic gains of about 700,000 square kilometers are enough to result in a global loss of around 1.3 million square kilometers over the period. That’s equal to about 35,000 square kilometers lost each year or an area the size of the State of Maryland. Finally, it’s important to note that recent studies have shown (as hinted at above) that sea ice gain around Antarctica is being driven by cold water and ice berg outflows ramping up as the great glaciers of Antarctica increase their melt rates. The melt, which is driven by a pool of warm water expanding hundreds of feet beneath the ocean surface and at the base of ice sheets and ice shelves is creating a kind of heat conveyor which spreads cool water along the surface even as it pulls more warm water in from underneath. So it appears even the slight ice gain for Antarctica has a connection to human caused warming. One that is even more ominously linked to an exponentially ramping rate of land ice loss from Antarctica itself.